"Eating well shouldn’t mean that you can’t have treats. But even your treats should be made out of real food." To enter the sweet butter-scented refuge of McCrea’s Candies in Hyde Park, MA is to become enveloped in a world of all things delightful. In the back kitchen, there was the bubbling pot of soon-to-be caramel, that, when poured over a sheet tray, folded onto itself in thick ribbons. There was the seemingly endless rope of cooled caramel snaked across a prep table, ready to be stretched and pulled. And there was the rhythmic thrum of the red machine that swiftly chopped and wrapped each candy. 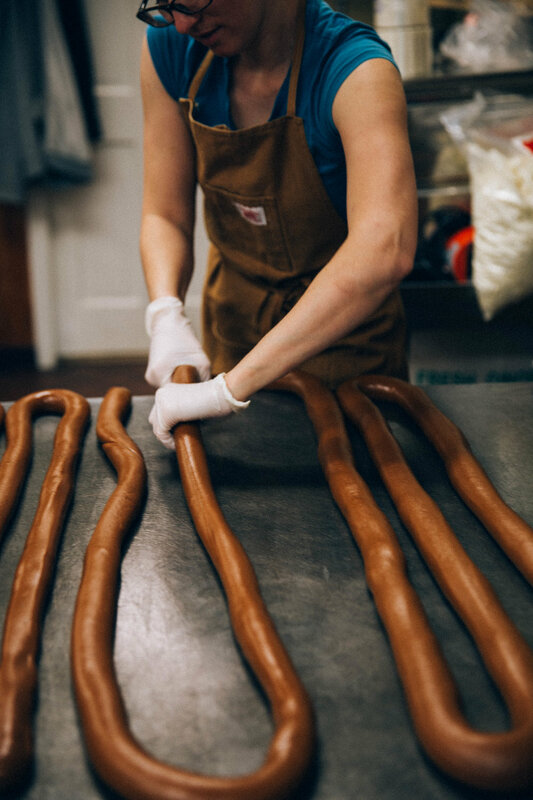 I had the unique opportunity to sit down with Kate McCrea, Co-Owner & Marketing and Product Developer of McCrea's Candies, to discuss not only how it all started, and but also how delicious and unhealthy don’t have to be synonymous. Kate McCrea, at the McCrea's Candies kitchen in Hyde Park, MA. Gwen Koch: So why caramel? Are you as in love with it today as you were when you started? 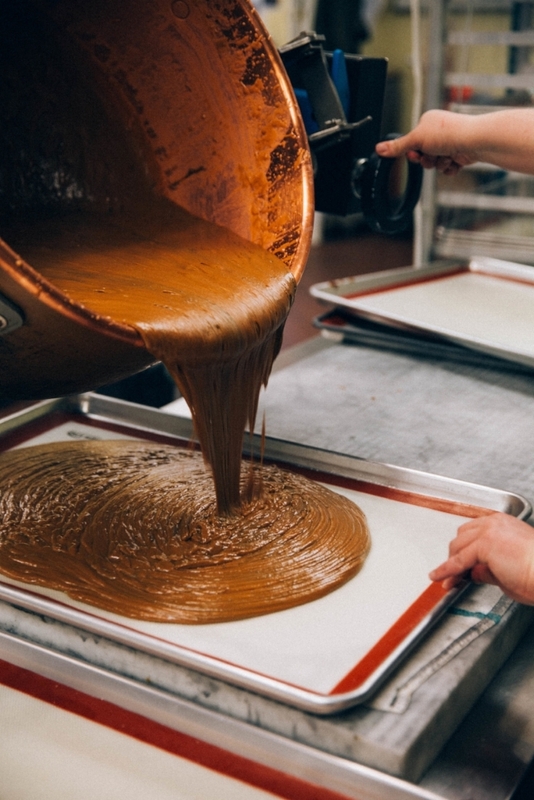 Kate McCrea: "My husband, Jason, and I started McCrea's Candies together— and he was definitely the charge-forward person between the two of us— but I really trace the seeds of this company back a bit further, even before the first batch of caramel was made. When [Jason] was laid off, it was a terrible time to be out of work in the economic down-turn. There were hundreds of thousands of resumés out there and no call-backs. It was our 15th wedding anniversary, and I insisted that we go away. So we went to Acadia National Park, rode our bikes around, and talked a lot about: What’s next?" Kate and Jason McCrea, both biologists by training, have always seen a strong connection between art and science. During their getaway to Acadia, they talked about hypothetical What's Next scenarios, like hooking an ice cream maker to the back of a bike and pedaling your way to a sweet cup of ice cream! They loved pondering these playful ideas, but never considered seriously putting something into action and starting a capital 'B' Business. KM: "It’s kind of a critical piece when you think, did we sit down one day and say: “Let’s make caramel; that’s our dream business!” That isn’t really how it happened. It was more thinking and seeing and making connections. While in Acadia, we read a newspaper article about a local woman who made caramel apples for trick-or-treaters and had been doing it for something like 60 years. We came home from that trip and our good friend's daughter was injured and in a body cast over Halloween (which is one of our favorite holidays) and Jason made her caramels as a gift." 1. Candy is chemistry— the science of it didn't scare either one of them. KM: "But Jason's also a detail person, and really good at what he does, so he made the caramels that Halloween, and they were fantastic. And our friends jumped up and down and said, 'Why are you even bothering to send out resumés?! You should do this.' Then we started to think: Oh, we might be good at this! We brought caramels to other friends, and gave some to our son’s teacher who made an order sheet, of sorts, and all the teachers started ordering caramel, and we thought, Maybe there really is something here." While Kate was still working, Jason took a solid year to plan and create the business. There was so much more to it than making good caramel. They had to sit down and ask themselves: is this viable? Could they make enough? How would they fund the project? What kind of wrapper would they use? Hand-wrapping, though they did that for a while, was simply not an option; they couldn't make enough. Once the foundation was set, they went into a shared kitchen space called Commonwealth Kitchen where makers rent space hourly. KM: "Funny stories from that kitchen! Caramel is very susceptible to humidity, and when you’re in a shared kitchen, you don’t know what other people are working on, so you’ve got food trucks coming in and opening and closing the doors, and all the humidity is entering the space! We had a supplies cage, and we hung plastic sheeting inside, and placed a small de-humidifier within to create a dry zone. It was really strange-looking, but we made it work! And that kind of problem-solving was fun for us. We started doing really tiny farmers markets, and even with a small number of people passing through, most of them wanted to buy caramel. After about a year, we started working with our first wholesale customers, and we quickly outgrew the hourly kitchen space. We added a third business partner, Jim, who also happens to be our neighbor for the last fifteen years. He owned a restaurant for 30 years, and he’s a good businessman who knows his way around a kitchen. The three of us all lived about two miles from here, and it was HUGE when we moved to this kitchen space. Now we’re squeezing out of it, but being here really allowed us the growth we had to have to become a real company." KM: "We started with a 'farmers market' brand— had a little cartoon on it— that had a very local feel. The caramel has always sold, but when we were working with retailers, we found that it moved slower, because we weren’t standing there, selling it. In 2015 we went through a much bigger re-branding process: we dug right to the bones, moved everything out (in a sense), and re-branded from the ground up to really reflect who we are and what the product is, including the elimination of plastic packaging, which was really important to all of us. The stunning, eye-catching packaging that McCrea's uses now is the result of that huge re-branding process in 2015. KM: "As a scientist who has followed studies of plastic found in the ocean, [plastic packaging] really bothered me. Even if it's recyclable, you're counting on other people to clean up the mess that you’re making. That’s how I see it. So we went to a paper package. We went to a differentiating package. There’s a lot of intentional flavor development and knowledge behind our product. It’s not really about producing as much as we can. Our fresh ingredients are one of the things that sets us apart. Real maple syrup, fresh ginger, fresh rosemary.... Rosemary steeped, almost like tea. Rosemary cream that smells SO good! We’re not going to compromise there." GK: What inspires each of the flavors? Do they have a personal connection? KM: "The first flavor was 'Plain,' which we call 'Vanilla,' because we put a good amount of vanilla in it. The Black Lava Sea Salt is probably one of the most personal flavors, because Jason spent so much time trying all different types of salt. Pink salt becomes invisible on caramel. White salt, same thing. Grey salt, same thing. Black salt. Black salt tastes fabulous, because the carbon in the black salt pulls bitterness, and it looks gorgeous, which goes back to the artistry of it. There’s some contrast there. Vanilla, Black Lava, Ginger and Mocha. Those were the first four flavors we ever made. For a while, we used to hand-cut the caramels into squares, and Jason would place a single coffee bean on each one. 'Caramel Eyes' is what we called them. We used to line them up in a tie box. I think Macy’s [department store] gave Jason a huge box full of tie boxes, and we put our sticker over the Macy’s label, and then on a small piece of parchment paper within the box, he’d carefully line up these beautiful caramels." GK: Do you think your science background has helped you with development? KM: "Absolutely. We’re open to trying different things— different solutions to a problem. We’re used to collecting data. Every batch we’ve ever done (EVER!) has a data sheet associated with it. From the very first batch. Jason would specify, I couldn't cut this. It was sticking to the X, Or just, Too hard to cut. Very important when you’re working with something like Scotch, for example, which impacts the texture. Both of us have always loved food, and we love craft, and we love science, and we love people, and we’re both data crunchers. McCrea’s Candies is really the culmination of everything we’ve ever done." As Kate described scientific methods and toured me around the space, it became clear that the lasting charm of McCrea's is characteristic of Jason and Kate's way of creating and owning a business: fastidious yet playful, and always striving toward a balance of natural and simple in a way that is their own. We moved on to discuss the challenges of being a consumer, and while sometimes it seems that we're making strides in demanding transparency, some of the language on food packages and ingredient lists feels not only confusing, but also deceiving, and perhaps this is exactly why small food and beverage businesses are having a moment right now. KM: "I think some of what’s driving that is people being more educated about food, or, food and where it comes from, and then getting annoyed, and feeling like, I could make something wonderful. I could make something that doesn’t do X, Y and Z and is still wonderful. For us, in that year where Jason was doing product development and creating this business, taking out the corn syrup was really important to him. What does corn syrup do in candy? Most people think, I dunno: it’s sugar. No. It has a specific function in candy, so that it keeps it from crystalizing. Why? Because it’s an invert sugar, and it’s the balance that determines whether your candy crystalizes or not. It also determines the flavor profile. Too much fructose— the high fructose corn syrup— and you get a flat, sweet taste on the front of your tongue, and the flavor is gone. I can taste it the second it hits my tongue. We tried all different sugars and we finally found inverted cane. We love that! We dig in to this kind of challenge. Jason does these talks at high schools, and brings in his molecule model, breaks it in half…. But that’s kind of what I mean. We started learning more about food, and thought, I can do something about this. I like candy. What’s all this stuff in here? I don’t want that! But I still want candy. So I wonder if sometimes that’s where people see a lot of opportunity. I pointed out how much I love the simple, yet sophisticated, look of McCrea's brand and packaging— how it draws a beautiful connection between food and art. KM: "You want the packaging to represent what’s inside. It’s the indication that it’s something special. There are even things on the tubes that you don’t notice until you buy it. There's a colorful design on the inside lip— a little pop of surprise! The designers were trying to capture the unexpected part of McCrea’s. It's very important that it’s a whole experience— not just the caramel. And when you eat one, it should match the experience of the packaging. Natural and simple is a really difficult balance to maintain. If you look at the caramel world, you could run in a million different directions, and sometimes it takes some discipline to hold your ground. Sometimes you’ll start to see this obsession of adding and adding and adding." GK: Has being this involved with caramel changed the way you think about food or interpret flavor? KM: "Yes. Specifically caramel? Somewhat. Because I look at candy in a different way. Eating well shouldn’t mean that you can’t have treats, but even your treats should be made out of real food. I think you should recognize what’s on our labels, and that’s that. But being involved in the food industry, in general, is very eye-opening, and makes me more committed to real food. It’s good and bad sometimes. If you look at ingredient lists, there’s a lot of weird stuff on there. And I don’t like to see things like 'Natural Flavor,' and 'Natural Color.' I don’t know what that is, and I don’t like it. As a scientist, I've always read labels, but it’s really more as a food industry participant that pushed me to read labels more carefully. The other part that stands out to me is branding. I take notice of what brands I’m loyal to, and why. And what brands I feel betrayed by with the tricky language out there. It affects me personally, and me as an advocate for the food world." GK: What are your biggest pieces of entrepreneurial advice for other food entrepreneurs? KM: "1. Find people who know more than you. That’s absolutely a must. And look at the big picture. With our new brand, for example, that was a big picture decision, and it really paid off. The small picture decision would have been: We can’t possibly afford this! Let’s go with the cheapest proposal (I can still hear the arguments in my head). I think those two actually go hand in hand. 2. You need to have a realistic view of where your business stands. When you’re selling in farmers markets, stick with a farmers market brand! But don’t assume you're going to go into Bloomingdales with that brand. 3. Hire a 'No' Man. Jim is our 'No' Man. We have these crazy ideas sometimes, and Jim is there to say 'No' to quell unbridled enthusiasm that isn’t going to get us anywhere. Enthusiasm is awesome. Enthusiasm for something that's blinding you to bigger problems is not awesome. You need people who encourage you, but who will also pull you down and keep your feet on the ground. I don’t think you can go forward without that kind of framework. If you need someone else to be doing that analysis with you, then get someone else. Jim never would have come on board if he didn’t think we had something to build." McCrea's caramel flavors include Classic Vanilla, Ginger Fusion, Dark Roasted Mocha, Single Malt Scotch, Rosemary Truffle Sea Salt, Tapped Maple, Black Lava Sea Salt, Deep Chocolate, and Cape Cod Sea Salt, among other rotating seasonally inspired flavors. Unexpectedly, Rosemary Truffle Sea Salt was my favorite flavor. The way their website describes it is "Fresh-from-the-garden rosemary mingled with truffle sea salt. Savory magic." The foundation of creamy caramel shows off rosemary's cool, eucalyptus-y evergreen flavors. The truffle is subtle and keeps the whole thing from tasting overly piney. The slight crunchiness of the sea salt provides an enticing texture that makes you want another one (or...the whole tube!)! Read more about the McCrea's story here. You can purchase McCrea's hand-crafted caramels through their website, or find them on retail shelves all across the country. In the Boston area, McCrea's caramels can be found at Boston General Store, Brookline Grown, Formaggio Kitchen, Russo's and Allandale Farm, among a number of other retailers. Follow along on Instagram @mccreascandies to find out about seasonal flavors and the latest updates. Special thanks to Diane Parazin for organizing this interview, and to the McCrea's caramel makers who were SO generous to let me photograph them doing what they do best! Such an incredible and kind team! "I feel like ganache is more decadent; it’s this new experience, and you have to eat it right after you buy it. That’s unique about my chocolates— their short shelf life of seven days. It’s supposed to be this celebration of ingredients and the occasion coming together." Alexandra Whisnant, Owner and Founder of gâté comme des filles, possesses a resumé that can only be described as badass. Once a physics student at Duke University, she took off a semester to go to pastry school at Le Cordon Bleu in Paris, became a stagiaire at the well-known pâtisserie, Ladurée, moved to Berkeley, California to work as a Pastry Cook at Alice Waters's Chez Panisse, got an MBA and worked as a consultant, launched gâté comme des filles in 2012, and is now making some of the best chocolates in the country out of Aeronaut Brewing Co. in Somerville, MA. I'm not usually one for bold statements like that, but these chocolates deserve to be eaten in exorbitant quantities. gâté comme des filles translates to "spoiled like girls." "I wanted something that was lyrical and French. I like this drawing because it’s like Alice [of 'Alice in Wonderland'] is suddenly a queen. I want you to feel that way, for a moment, when you’re eating the chocolates." "I didn't really discover [chocolate] until college, and it was because Whole Foods sold the big chunks of Madagascar Valrhona. Pastry school in Paris was very much about presentation and using chocolate as a medium to make pretty things. It wasn’t so much about taste. It wasn't until I returned to the U.S. for my senior year of college that I started eating more chocolate, and discovered these chunks of Valrhona and would just sort of gnaw on them as I was studying. So I think that was probably the intro to chocolate." How did chocolate become such a big passion for you? Why the obsession? "Let’s get to the bottom of this together, because I have no idea! People ask me that all the time. I guess I didn’t realize chocolate could taste like other things, kind of like when you have good wine for the first time. And I felt like it was more focused than pastry. I could just forget about a lot of the ingredients. I think I’m a very focused person-- I liked not having to worry about flour, eggs, etc. Fewer variables. And then, there’s a lot of subtly. I like the detail and subtleties." Alexandra's career in "detail and subtleties" began at the iconic French pâtisserie, Ladurée. "Ladurée was my favorite pastry shop in Paris. I started out doing laminated doughs, but dough wasn’t my thing. I loved the 11pm-7am shift because it was all about decorating cakes and tarts. I was doing gold leaf, and an assembly of macaron pastries." "It was magical. Alice Waters has a lot of visions, and then it was up to us to create the visions. To make them real. You just had to be ready to drop everything, and do something different. I loved it, because I loved her visions. When Obama won the election, for example, she wanted pomegranates everywhere. So I was putting pomegranates on display all over the restaurant. I wanted to create this festive environment that she had imagined." "We did a lot of ice cream and sorbet, tarts and cakes. I was there for two years, starting as an intern, but once I began to learn more, and was able to fulfill my duties, they gave me a lot of creativity with chocolate. Because I was obsessed with chocolate, and they saw that I was the most obsessed with chocolate, they let me run with it and make chocolates for downstairs end of meal in whatever flavors I wanted." Chez Panisse is all about touching food as little as possible. Everything is supposed to look like it fell off a tree; there’s a whole art to creating a natural look: "I started to do more of a natural thing with the chocolate. If I dipped a chocolate, I would leave a hand mark, so you could see where my hand was, and see the movement, making it less perfect. I think a lot of chocolates are very static. I try to create some movement. I could have a vision of what I want the chocolate to look like, and make it exactly that way, but I want it to express itself." "Ladurée is the opposite. My first day trying out at Chez Panisse, I was given dates and tangerines, and asked to make a display in a fruit bowl. I made these concentric rings with the fruit, and all the stems were pointing in the same direction— very French-looking. Then one of the cooks picked it up and dumped the bowl out, and said it should look like they fell off the tree. That’s when I first saw the difference between the French and Californian aesthetic. And then I just fell for the California aesthetic so hard, because it’s breathtaking, and I don’t like this look of over-manipulated food. It was the next level. I feel I’m good at detail-- I could easily line everything up perfectly, but it’s a lot harder to make it look natural and also beautiful." When asked how she decided to work specifically with ganache, Alexandra said, "I wanted to add value to the chocolate. I feel like ganache is more decadent, and because it’s fresh it’s this new experience, and you have to eat it right after you buy it. That’s unique about my chocolates— their short shelf life of seven days. It’s supposed to be this celebration of ingredients and the occasion coming together. I feel like I can express myself more and use more ingredients." Ganache is an emulsion of a liquid and chocolate— the liquid can be cream, water, alcohol, etc. There are different ways to go about making it, but Alexandra does a cream infusion: heats it in a double boiler, adds chocolate and mixes it all together. Then it’s emulsified. "Usually. Sometimes you have to use an immersion blender to really emulsify it. I like having some fluffiness, so I actually try to incorporate air bubbles to add a little fluff. Otherwise, it just kind of feels like toothpaste to me— like gel. After you have it all emulsified, you allow it to come to room temperature, chill it, and then you can cut it up, shape it, and dip it in tempered chocolate." "The tempering part does a lot. It aligns all the fat crystals into really tight patterns so the melting point is higher. If you have untempered chocolate, it melts in your hand, but tempered chocolate will melt in your mouth. It’s really incredible— it’s designed to melt at your body temperature, which is this weird coincidence. Even butter melts at a higher temperature. If you’ve ever made a cake that has butter and chocolate, the chocolate will melt first, which is weird because butter’s so soft. So tempering helps with the melting point, makes the chocolate shinier, and it has a snap when you break it. It increases the shelf life because there’s less air getting through. It makes it more beautiful." Alexandra's friends, family, experiences and places she has lived deeply impact the ingredients she uses today: "I’m focusing on the things I really like, for example, herbs: thyme, sage, peppermint... I was working with a tea & coffee shop in Oakland-- they sold my chocolates and supplied me with tea and coffee ingredients. Or, there is a mulberry tree in Oakland that a friend owns, and she would give me mulberries. My sister sends me lemons from her lemon tree in California. To make the connections, I usually try to bring the chocolates back to the people that gave me the ingredients to start a conversation. I get excited when I get to pick the herbs or fruit myself, and then make it into something. I wouldn’t want to pick out generic ingredients and use them. I like to be connected to the growers." What would be your biggest piece of advice for someone who wanted to start their own food business? "I think you need to create something different than what everyone else is doing; try to find your niche. Don’t listen to other people because everyone tries to tell you what to do. Everyone tries to give you advice on how to sell your product, what your packaging looks like, what you should make. You have to have tunnel vision, and not listen to other people. I wouldn’t enjoy myself if I was doing what everyone else was doing. The point of this is to enjoy your work. Although I guess some food businesses are just there to make money, but nowadays, I feel like it’s more about following your passion. I’m just happy to be able to make pretty things that taste good." I left this interview with thirteen whimsical little chocolates elegantly packed and taped into their colorful boxes. I ate three of them as soon as I got home, and it took all (all!) of my self control not to eat the other ten that afternoon. If you are concerned about the recommended shelf-life of seven days, you can stop worrying right now; I dare you to make these last more than two. Read more about Alexandra's story here. Say hello in person at her location within Aeronaut Brewing Co. where she makes chocolates fresh each week and sells them every Thursday, Friday & Saturday from 7-10pm, or you can find them on the shelves at Formaggio Kitchen in Cambridge or Boston. Follow along on Instagram @gatecommedesfilles to find out about new seasonal flavors and the latest updates. I hate to say it, but I've had a hard time getting here lately. It’s not that I didn’t want to stop by and say hi, it’s just that it’s been way too beautiful outside lately to be sitting indoors at my computer. I'm also recently getting into the swing of things at a new job, so there have been a number of distractions, but I'm thrilled to be here today-- THE WEBSITE MUST GO ON! A few weeks ago, I had the pleasure of collaborating on the Radius Pop Up Dinner in downtown Boston, with Chef Jitti Chaithiraphant, of Spring Summer Fall Pop Up Restaurant Series, and Chef Matt Foley, of The Merchant, as well as Jeremy Ogusky, Potter Extraordinaire at Ogusky Ceramics. Matt and Jitti met while cooking at a restaurant called Radius in 2008, and for this collaboration dinner, they crafted a thoughtful menu consisting of all local ingredients: foraged wild plants and herbs, handmade seasonings (fermented vinegars, fermented vegetables, sea salt, etc.) all sourced from within a 200 mile radius of the restaurant. I was lucky enough to join in on both the foraging, and photographing behind-the-scenes during this interactive and educational dinner. © 2015-2018 The Brine Project, Gwen Koch. All rights reserved.